Imbolc brings us the first glimmer of spring, the Earth is beginning to stir from Her long winter's sleep. It is a time for new beginnings, and many of us cleanse and purify our homes and sacred spaces in preparation for Spring. Bring out the sage smudges, floor washes, incense, moon water, brooms, dusters, and mops! Open the doors, open the windows, out with the old and in with the new! 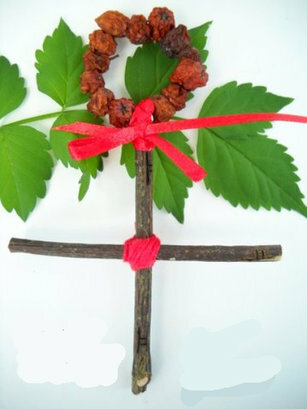 Once purified you may now create a Rowan twig charm to protect your home or sacred space. February is the Celtic tree month of Rowan and is associated with Brigid, the principle Goddess of Imbolc. The Rowan is a tree with powerful protective magick, and is ideal for this charm. You will need 2 small twigs about 6" in length. If Rowan is unavailable however, you may use twigs or small branches from any tree. You will also need red thread, string or wool. Wrapping the thread around the crossed twigs is a form of binding or knot magick. In this case you are binding the power of your intention (protection) into the Rowan's Cross with each turn of the string. 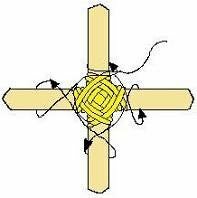 As you wind the string, strongly visualize the cross filling with protective energy. Glue or tie the two twigs into a cross and then knot the string around the center. Wrap the yarn around one stick, then turn the yarn deosil and wrap the yarn around the next stick. Be sure to wrap each loop snugly against the previous one. Continue wrapping until you are satisfied with the results. Leave about 6 inches of yarn to make a loop. Take a quilter's needle and tuck the end into the back of the God's Eye to secure. Hang your completed Rowan's Cross in your home or sacred space for protection throughout the coming year.